Mogherini is impressive, even to those of us who regret that Bonino’s time as foreign minister was truncated to just 10 months. At her discussion at Brookings, she was more forthright and authoritative than one might expect from such an untested foreign minister. When former prime minister Silvio Berlusconi yesterday suggested that an ‘EU plot’ pushed him out of office in November 2011, Mogherini swatted away a question in Washington about him, noting that Italy has already turned the page on Berlusconi. It was a masterful response, and it’s clear that it rankled Berlusconi’s fellow Forza Italia officials — Maurizio Gasparri, Berlusconi’s previous communication minister, subsequently mocked her trip abroad as nothing more than a shopping junket. As Mogherini noted, 40 is comparatively young in Italy — at least by the traditional standards of Italian commerce, government and society. Ukraine. Mogherini was incredibly forceful in standing with her European compatriots and US officials to form a united front with regard to the ongoing Ukraine crisis, with a stridency that’s sometimes missing from the German left, including German foreign minister Frank-Walter Steinmeier. Notably, while Mogherini believes that EU coordination over Ukraine has been strong, she argued that it may have come too late to stave off the more difficult crisis that Ukraine (and Europe) now faces. Iran. Though Italy isn’t technically a party to the P5+1 talks with Iran, Bonino played an important role in easing relations with Tehran, and she was the first European minister to visit Iran last December after the talks reached an interim nuclear energy agreement. Mogherini was surprisingly sanguine about the chances of a permanent nuclear deal as the July 20 deadline looms. She noted, rightly, that Iranian president Hassan Rowhani needs a deal for internal political reasons, including, presumably the sanctions relief that could help boost Iran’s ailing economy. Arab Spring. Given its position as a peninsula in the Mediterranean Sea, Italy plays a key role in EU relations with the North Africa and Middle East. From the days of the Roman wars against Carthage, the Italian peninsula has always had a special relationship with North Africa. Former Socialist prime minister Bettino Craxi, after leaving office in disgrace, promptly decamped to Tunisia, where he died in exile. Furthermore, Italy is currently experiencing record levels of North African and other emigrants on its southern perimeter. Despite the failures of the Arab Spring movement, Mogherini pointed to Tunisia and Lebanon as two success stories and argued that the EU should be doing more to support them. She added it was a ‘miracle’ that after three years of civil war in neighboring Syria, the much smaller and deeply vulnerable Lebanon remains intact. Libya. In particular, Mogherini noted that Libya’s lack of institutions make it a perfect corridor for migrants from the rest of Africa into the European Union, and she admitted that it’s a potential security and energy threat. She added that Libya, which was briefly colonized by Italy in the early 20th century, is a ‘state without a state,’ even during the four decades that Muammar Gaddafi ruled Libya. 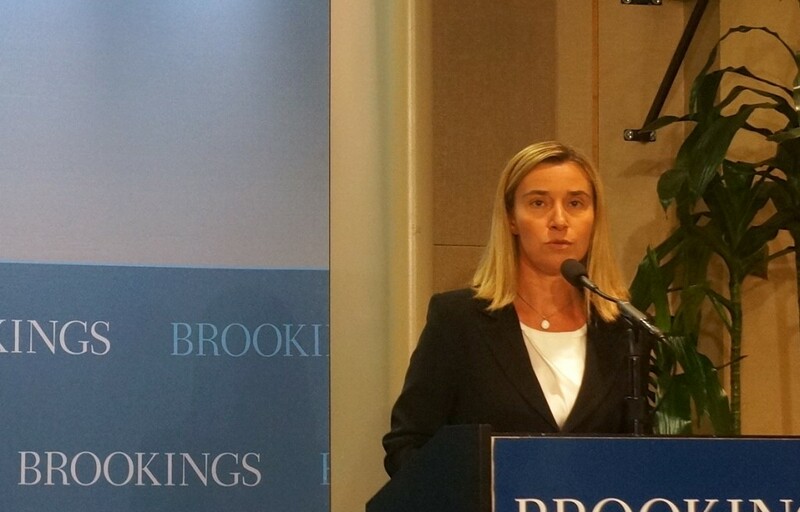 Italy, Mogherini said, would continue to pressure Libya’s interim government(s) to build stronger institutions. The rise of euroscepticism. Mogherini tried to downplay the ‘anti-system’ euroscepticism that’s on the rise in both Italy and Europe more generally — both Berlusconi and Beppe Grillo’s protest Movimento 5 Stelle (M5S, the Five Star Movement) have railed against Brussels in the current European parliamentary campaign. She argued that it doesn’t make sense to choose between being pro-Europe or anti-Europe for the same reason that it doesn’t make sense to choose being pro-Italy or anti-Italy. Instead, Europe is just the political space in which Europeans, including Italians, inhabit. European Commission race. Italy will hold the EU presidency beginning July 1, when EU actors will determine the future presidents of both the European Commission and the European Council and the EU foreign policy chief. Under the new Lisbon Treaty, the European Council must approve the Commission president by a qualified majority vote, ‘taking into account’ the EP elections — the Commission president must then be approved by the European Parliament. There’s some argument over what it means for the Council to ‘take into account’ the election results. Mogherini noted that the decision of the major European political party families to field EC presidential candidates, including Martin Schulz and Jean-Claude Juncker, means that European voters expect some degree of coherence after the elections conclude on May 25. She added, however, that she envisioned a ‘confused situation’ after the election, and that it’s unclear what might happen. She warned, however, that an extended period of wrangling over the Commission presidency and other offices ‘will kill Europe,’ and would empower eurosceptic movements.